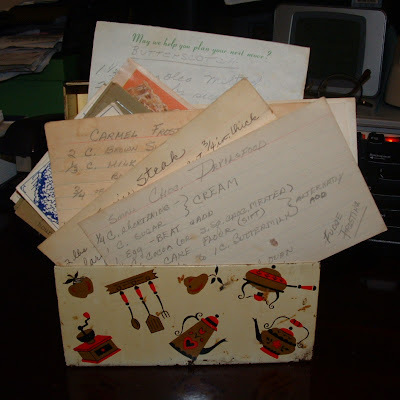 Whenever I go antiquing or through a thrift store, I'm on the lookout for old recipe boxes. Not just any old recipe box, but old recipe boxes full of old recipes. Well, I hit the jackpot today! I found this box stuffed full and it only cost me a quarter! The recipes I love to find are the ones from WWII or before - you know the kind that called for 5 cents of hamburger, were all hand written and made from scratch. It's really fun to find them chicken scratched onto old note pad pad that has an address so it gives you an idea where they originated. While today's appear old, they are probably more from the 50's. Some recipes that I will try soon are Swiss Steak, Forgotten Cookies, Jambalaya, Cherry Pie filling, Peanut Blossoms and Cherry Crunch Desserts.